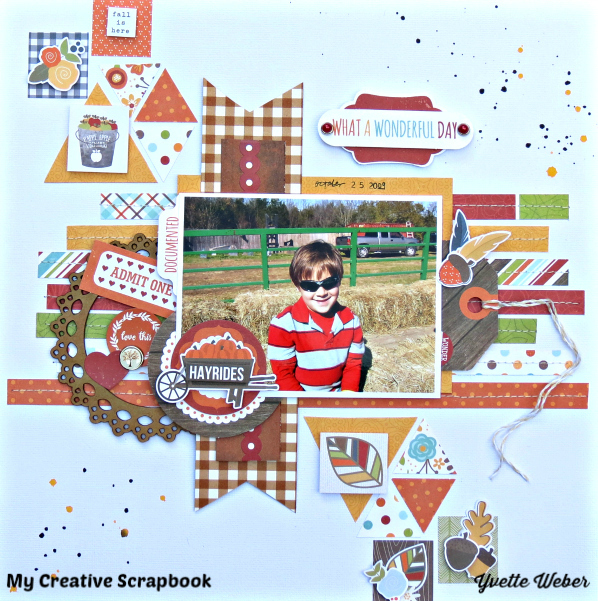 I'm stopping by to share another layout for My Creative Scrapbook that I created using the November main kit! This kit is full of all the beautiful fall colors, great for document family and friends together! I layered some strips of patterned paper across the back of my layout, machines stitched to hold in place....started to add my layers behind my photo and then creating a few little clusters,using stickers, die-cut cardstock pieces, brads and a chipboard frame! Here you can see I cut some triangles out and place one clusters to the bottom right and another cluster to the top left...on top of a few triangles I place a sticker and using form dots underneath to give it some extra dimension! I finish my page off by adding my title and some paint splatters!